The League of Extraordinary Gentlemen Movie Poster 27 x 40. 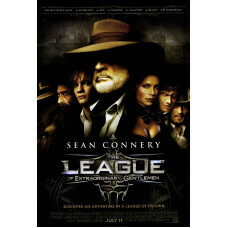 The League of Extraordinary Gentlemen is an American comic book title which began in 1999. The series spans two six-issue limited series and a graphic novel from the America's Best Comics imprint of Wildstorm/DC, and a third miniseries and a graphic novel published by Top Shelf and Knockabout Comics. According to creator Alan Moore, the concept behind the series was initially a "Justice League of Victorian England" but quickly grew into an opportunity to merge many works of fiction into one world.